Our children today are part of a society, which is increasingly asserting them to greater competition and intolerance. Unrealistic expectations, culture of consumerism, excessive indulgence in technology (information), etc is to a large extent responsible for the avoidable pressures on these children. The requirement of very high marks to get admission in an institute of higher learning of choice, after school, adds to the confusion and uncertainties. All these factors, in turn, become a source of stress for the young children. If the aforesaid is true, then a question that often comes to the mind is – are we actually preparing our children to deal with the challenges and uncertainties that gape at them because of the tough competition they are likely to face when they grow-up into the 21st century?. In other words, keeping in mind the well defined requirements of the future, have we put mechanisms in place in our education systems that will take care of preparing these children to be successful when they grow-up into adults. The answer is obviously -‘not enough’. To effectively deal with this issue, we not only have to endear our children to get good marks in examinations, but also develop in them higher order skills such as critical and logical thinking ability, aptitude for research and analysis, decision-making, inter-personal relationships, team-work, respect for environment and human life and dignity, etc. 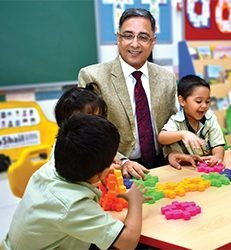 This can be achieved by moving out of the conventional techniques of education and adopting new comprehensive approaches that make education, experiential and hence an activity of joyful learning. In simple words, education in schools needs to go beyond just teaching for exams. Students should be intrinsically motivated to learn from within. Pedagogies that afford the above mentioned sort of learning are in the process of evolving and are already being followed successfully in many progressive schools in our country. Such pedagogies essentially revolve around the philosophy of learning by doing. These schools are student centric rather than being teacher centric wherein the role of teachers is not only to pass on information, but also, be facilitators, enabling their students to effectually utilize the information for solving real-life problems. It is thus, imperative that the existing education systems in our schools be appropriately synergized with the new pedagogies as well as technology to cater to the futuristic subsistence of our children.